Towards the end of the 1970s, the SH7 was the crowning glory of Roland’s massively successful line of SH synths. It featured a duophonic-capable architecture with two fully-fledged oscillators plus a third “organ” oscillator which blended five different frequencies of square wave in with the sound. 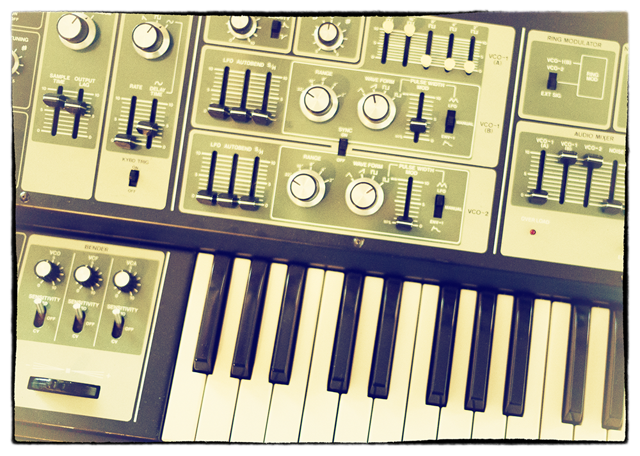 It had modulation and routing possibilities that put it a close second to a System 100 modular in terms of flexibility. A resonant low-pass filter came coupled with a high-pass, which gave a lot of scope for different textures. And the whole thing was wrapped up in a gorgeous, hands-on design that made creating sounds a delight. All in all, it should have been a world-beating instrument. Strangely, perhaps, it wasn’t. Its filters were its Achilles’ heel: in the late 70s, prog-rock gods wanted thick, chewy, Moog-style ladder filters to handle those classic screaming synth widdles. The SH7’s filters sounded thin by comparison, and it fell from favour – especially by comparison with its little brother the SH5, which did have screaming chewy filters and was cheaper too. So the SH7 began to look like a bit of a mis-step by Roland, unless complexity and sound-design were your thing. But time has a way of changing things. As prog-rock faded, a new breed of musician started to discover the SH7 as something of a closet classic. For electronica, experimental music, and the dance and techno brigades, the SH7’s unique tone and extensive sound-shaping capabilities made it a perfect monster of a synth, if you could get your hands on one. At last there was some love for the SH7. Here at Rhythmic Robot we seriously feel that love. The SH7 is an absolute triumph of a machine: complex, sure, but friendly and rewarding at the same time. It has a voice all of its own, with richness coming from the oscillators rather than the filters, which really serve just to sculpt the sound, rather than define it. Programming it is huge fun. We wanted to create a software version that captured not just those oscillators, but that fun as well… and so the impetus behind SH Poly was born. 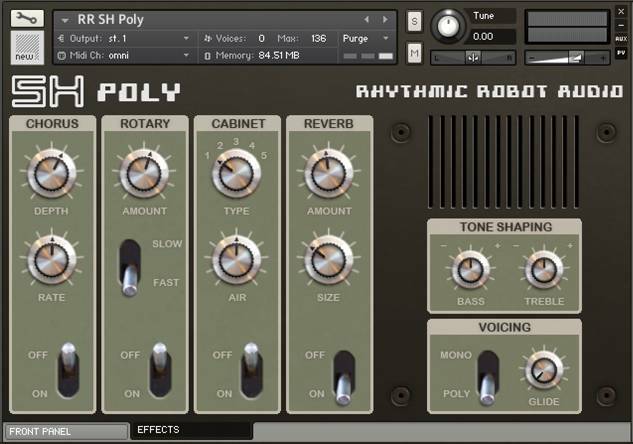 SH Poly is, as the name suggests, a polyphonic take on the duophonic SH7, giving you the SH7’s guts but letting you play them like a Jupiter. We sampled every oscillator the SH7 has to offer, plus some crafty combinations and variations, so that the base sound palette on offer is extremely broad. Triangle, Square, Pulse and Saw waveforms are joined by Square+, which is built from the “organ” squarewave oscillators, and a “synced saw” wave captured from syncing Osc 1 to Osc 2 on the original. The two oscillator sections can be detuned relative to each other, for instant warmth and richness; but you can also get this by combining, say, Osc 1 Square with Osc 2 Square+, or Osc 1 Saw with Osc 2 Sync Saw, for subtler flavours of depth. But the Multi-Osc section takes this all a lot further. The flick of a switch adds a further four virtual oscillators to the original two. Flick it again and you get eight additional oscillators, for a massively thick, dense rush of sound. Multi-Osc expands your sonic potential way beyond the original SH7, into lush pads, enormous synth-strings, dense soundscapes, and phasey chorussy analogue heaven. The original SH7 could be overdriven in its Amp section – there’s a neat little “Over Load” LED to show when distortion is happening, and while it’s almost certain that Roland saw this as a warning, we have to admit we spend a lot of time making sure it lights up. That Over Load function is recreated here and helps push the SH Poly into grungier, grittier territory when you want it. Getting at unusual and inspiring tones is of course made a whole lot easier with the inclusion of our neat little Glitch button. One click randomises all the panel settings, but within generally musical parameters (most of the time, at least) so that you get useable results more often than you would with pure randomising. This is a great way to start a musical journey with SH Poly, and if you don’t like the results, just click again! Instant new patches, and instant inspiration. Two LFOs can be routed all over the place: to oscillator pitch, filter cutoff, or amplitude, for some pretty neat modulation options that can really add some movement and depth to your sound. Round the back are some vintage-inspired effects to round things out: a kind of classic synth pedalboard of Chorus, Rotary speaker, Amp Cab simulator and Reverb section, plus a handy dual-band EQ tuned to the SH7’s tone and a Voicing panel with portamento / glide, to let you go back to your mono roots. 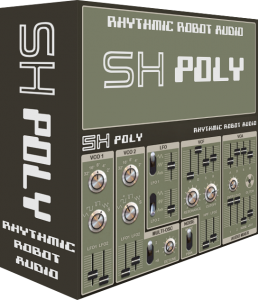 SH Poly takes the fantastic warm, breathing oscillators of the SH7 and brings them to you in polyphonic form. It’s easy to use, but deep enough to get you to all kinds of musical territories. For a taste of Roland’s top-of-the-line analogue sound from 35 years ago, look no further! (All our Kontakt instruments require a full copy of Native Instruments Kontakt v4.2.3 or higher (including all versions of Kontakt 5). Kontakt Player is not supported: instruments will load, but will time out after 15 minutes. See the FAQ for further information.) You can read more about the original hardware Roland SH7 here. “Rhythmic Robot are so committed to preserving the ancient and the crotchety, I’m relying on them opening a nursing home one day. With everyone celebrating past analogue glory at the moment, SH Poly is a nod towards Roland’s relatively rare duophonic synth, the SH7. It follows the well‑worn path of combining cleanly sampled recordings with a recognisable interface, plus a series of example patches highlighting what it can do. From a fairly modest synth engine, this turns out to be quite a lot. It’s worth noting here that SH Poly requires the full version of Kontakt (v4.2.3 or later). So what do you get? Well, polyphony and an interface crying classic Roland for a start. The panel’s knobs and sliders are dead ringers for those of the fabled SH5, SH7, System 100 and others. 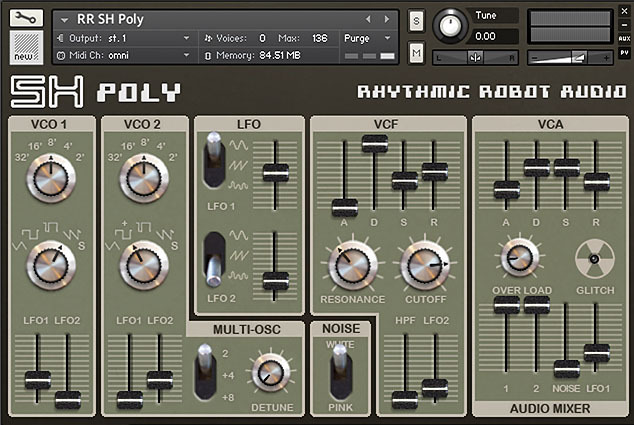 SH Poly may be built from Roland samples but the filter used is one of Kontakt’s own, and though it doesn’t immediately suggest the exotic and analogue East, it’s serviceable enough. The two oscillators host a broad selection of waveforms, including triangle, square, pulse, saw and square+. The last of these is sampled from the SH7’s five mixable square waves, although here it lacks any control over individual levels. Finally there’s ‘Synced Saw’, the stolen essence of a synchronised VCO. It’s a static sync waveform, but a useful extra flavour all the same. The oscillators can be detuned in the usual way or with a flip of a switch you awaken the Multi‑oscillator. This adds four or eight virtual oscillators, beefing up the proceedings considerably, especially in the swooshy strings department. Overload introduces a harder, overdriven tonality that I personally found more suited to single notes than chords. There are two envelopes and two LFOs. Unusually, one of the LFOs looks to be accessible from the audio mixer, but it’s more of a graphical quirk really. Nevertheless, thanks to the wide range of LFO speeds, audio‑frequency modulation is a worthwhile ingredient for escaping plain vanilla synth tones. Similarly, a Glitch button scrambles the parameters and generates entirely new patches. It isn’t wild, uncompromising randomisation either. Glitch’s output is usually more musical than weird. RR SH Poly is indeed a little gem! I picked it up as a prelude and pre-taste of SH Studio, which I hope to get some day. Notably, it is capable of some Boards of Canada-esque autonomic drifty acrobatics which put it in a prime spot in the toolkit! Presence of the hallowed glitch / rnd button means the adventure never has to end. I love synths and I love Rhythmic Robot! This is a fine emulation of Roland SH-7! Analog, warm, rich, retro, vintage sound with character!!! A simple architecture subtractive synth with bags of attitude and versatile as hell! Oh, and its really cheap! Loads of character! Inspiring and quirky. This is a go to whenever I need something gritty and unique. Sounds so awesome. You guys are the masters of translating vintage analog sounds into Kontakt libraries. It’s mind-blowing. This is just another piece of evidence that you guys have mastered your craft. Well done! Positively vicious !!! Really this is an analog with attitude, with a capital A. This mean little machine can chuck out walls of bottom end and still manage to be both piercing and delicate at the same time. Nice range of presets that really show it off, from delicate pads and strings, through a bunch of radiophonic noises, to a batch of very useful drums and percussion. For £12, you really can’t not have this.